Why not use cotton for you next acoustical project? 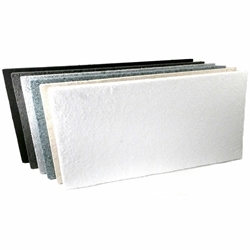 Echo Eliminator™ acoustical cotton is a high performance acoustical wall panel. It’s Class A fire retardant and has No VOC’s, no formaldehyde and no warning labels. It’s also fungi, mold and mildew resistant. Echo Eliminator™ is 100% recyclable. When your next project requires acoustical materials think cotton, the perfect environmentally and people friendly acoustical material. APPLICATIONS: Bonded Acoustical Cotton panels are ideally suited to school gymnasiums, cafeterias, classrooms, churches, multi-purpose rooms, community centers and more. SIZES: Standard Sizes: 24" X 48"
Please note: Although we take extensive precautions and purge the lines between colors, due to the manufacturing process color inconsistencies including dye lot variations, flecks, specks, and other slight surface blemishes are unavoidable. Please call for details. All sizes are nominal and are subject to manufacturing tolerances that may vary + or – 1/8”. Exact fitting may require on site adjustment by the purchaser. Exact size and other unavoidable variables such as dye lot color variances, lighting conditions, pattern matching, directional materials, expansion and contraction due to environmental conditions. Project with exacted visual requirements and expectation must be identified for our special attention prior to ordering.